Let's face it, the war between console and PC gamers will never be won. One side opts for the comfortable, easy feel of a game controller, and the other craves the old school feel of the classic keyboard/mouse combo. However, there times when the lines can be blurred and cross-over gamers can have the best of both worlds, and that's why we're proud to introduce the Xbox 360 XFPS 3.0 Sniper PLUS Keyboard/Mouse Interface. 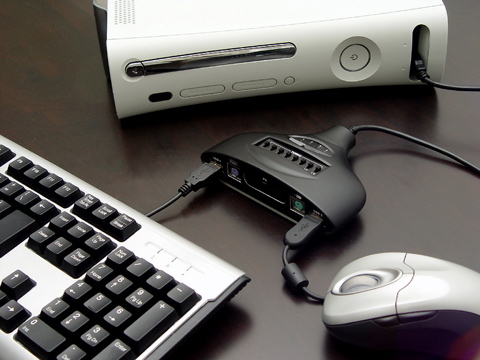 This amazing little Xbox 360 mod will allow keyboard/mouse enthusiasts to plug into the Microsoft console and play games they way they would on their standard PC. The interface offers instant Plug and Play technology, allowing a simple and effective way to get right into the game. This method is ideal for use with all of your favorite First Person Shooters, including Halo 3 and Call of Duty 4. To add further advantage, the XCM Xbox 360 XFPS 3.0 Sniper PLUS Keyboard/Mouse Interface even brings auto-fire functionality to the Xbox 360, allowing you to take down all of your online opponents with ease. Use Playstation 2 Dual Shock Controllers on the 360!